They say, “Think of a messy room as your inbox, and all the items in your room as emails. It’s much harder to be productive in a room where everything is strewn around. However, if all of your socks are in your sock drawer, your shirts are on your coat hanger, or your pencils in your pencil case, then not only will you be much more productive, but you’ll know where to look when you need to work on a particular task or project. TechZulu caught up with the founders and this is what they said. Let’s say you’re looking for an apartment. You may get emails related to our apartments at random intervals in your inbox. 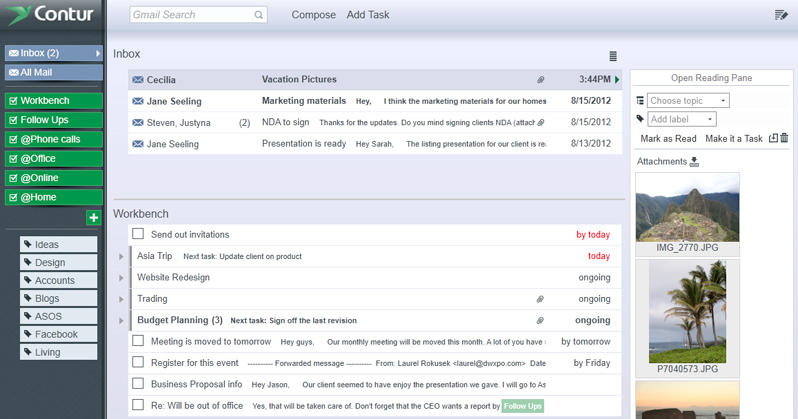 What Contur does is as those emails come in, they will automatically be grouped under your project “Apartment Search”. This works especially well if you get over 100 emails everyday, as we can then sort all incoming emails into “Meeting requests”, “Progress report”, “Budget Proposal”, etc. What made you want to build this? We met an executive who got over 100s of emails everyday, and was quite overloaded by it. He then hired a personal assistant who would read his emails for him, and then sort them by projects, and hand them to him presorted. That saved him hours of time every week, and so our inspiration was to replicate that experience without needing to hire an expensive assistant. Justyna Wójcik, our CEO, is a seasoned software developer and team leader. At Microsoft, she architected several core technologies of the SQL Azure cloud service, most notably the cluster resource management. Before that, she was a technical team lead at Motorola, developing mission critical communication software. Her vision and leadership skills are bringing Contur to life. Bruno Denuit, our CTO, has worked for over ten years on database technologies and cloud services at Microsoft in Redmond. His career started in the SQL Server team, focusing on query languages and query optimization. When Cloud Services started to emerge, he joined the newly formed SQL Azure team as a senior software engineer, with the daunting mission of converting SQL Server into a cloud-based service. He also architected web-based trading platforms for several investment banks. He is passionate about developing reliable online services and structuring data. As the technical lead of Contur development, he is working on creating a solid reliable service. Herry Lian, our COO, graduated from Stanford University with a degree in Management Science and Engineering. Prior to joining Contur, he founded a successful business, and was a finalist at a South by Southwest Startup competition. He’s passionate about tackling difficult problems, and his goal is to scale Contur to another successful business. We all experienced email overload in our lives, and felt that there was no adequate solution for our pain out in the market. Instead of waiting for one, we figured to manufacture one ourselves. Yes, we’re powered by a seed round, and funding from Start Engine LA. Initially we’re offering our software for free for people to try in our beta. Once we have enough samples, and our organizer is fairly good in organizing everyone’s email, then we’ll announce our business plan. Aren’t there other apps doing the same? Not necessarily. There are a lot of apps that filter your emails, or set up rules, but none that organize your emails for you by context. The difference between our software and others is that we could take an inbox of 1000, and within 15 minutes organize it all by related emails, and sort out the unimportant ones. This is why we are unique and if we weren’t, I don’t think we could succeed in the market right? We’re going to have pending patents for our technology. To our knowledge. No one has been able to semantically organize your emails yet, so we hope to protect our technology and create a business around it. Yes, a lot of people have told us that email is a difficult space to work in. That doesn’t really deter us though. We knew it was hard to begin with,which is why we decided to tackle it. We’ve come from backgrounds where we had to face difficult problems, and have successfully overcome them. This is just another one of them, and we’ll keep trying until either we solve it, or when we’ve exhausted all options. We’re very excited to announce that our organizer will be available online in about a week for everyone to try. You can see the results of Contur’s engine right on your screen. What if email dies, do you have other plans? In 2010, there was approximately 294 billion emails sent per day. Email is not going away, and neither is email overload unless we tackle it directly.